This is a cross-over costume type picture of 4 characters by the same creator, but two different manga. The two big characters are Kenshin and Kaoru form Rurouni Kenshin. 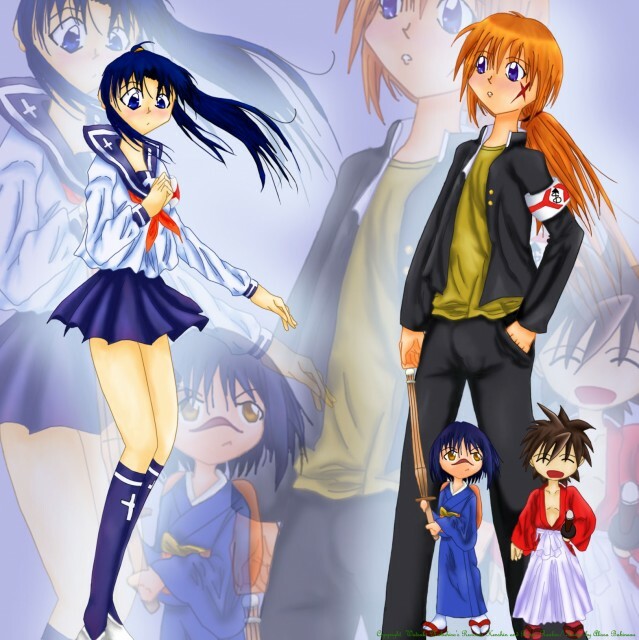 The two chibi type characters on the bottom are Kazuki (the Male for those who don't know) and Tokiko (the female with the scar on her nose) from Watsuki's new manga Busou Renkin. I traded outfits with the characters, so Kenshin is where Kazuki's school uniform and Kaoru is whereing Tokiko's school uniform. The background effect is VERY NICE as well. It gives it a wall touch actually, which makes me love this that much more. Great job Ari-chan ^^ Your such a great artist =D. You are sooooooo cool =D. Wahh~ A true artiste! ^^ Very cute and I love the way you did the bg. Really awesome work ^^ I love the "criss-crossing" idea. Really nice :d!!! Nani nani nani?! Watsuki-sama's got another manga?! (o_o) Sylvaocer want! and the pic is just friggin' cute! omg, i LOVE kenshin!!!! **huggles him** kenshin's toooo cool!! !